The Allisons held similarities to American duo the Kalin Twins of a few years earlier. They harmonised their voices beautifully, had one enormous smash hit, and then struggled to get recognition for much else. Perhaps it was being so successful too quickly that ultimately proved to be a handicap by raising expectations too high. Whatever the reason for their very short spell at the top, the quality of their recordings would seem to indicate that they should have done better. Although Brian Alford had been singing in the choir of Saint Dionis Church in Parsons Green, Fulham, since an early age, it wasn't until around 1956 that it occurred to him that he might be good enough to become a professional. Although he came from a poor background, he managed to raise the sum of £2 2s (£2.10p) with which he purchased his first guitar. He was fortunate to find a local jazz musician willing to teach him how to play it. Like so many youngsters in the UK at that time he became a skiffle enthusiast. It wasn't long before he had formed his own group, "The Shadows", at his local church youth club. Despite starting work as a trainee draughtsman, Brian began writing his own songs- an activity that would have a huge influence on his future. By 1958, Brian and a fellow member of the Shadows, John White formed a duet- calling themselves the 'Shadows Brothers'. The gigs they did were mostly unpaid, but they longed to try their talents in the burgeoning coffee bars of London. However, parental approval for taking themselves to Soho to do this was not forthcoming. They entered an audition in Finsbury Park- and from this became Carroll Levis "Television Discoveries"- they performed in two shows which were the highlights of their careers up to that time. In January 1959 John White decided to quit, and Brian Alford carried on as a soloist until August when he began a new partnership with Colin Day- somebody he sang with in the church choir. At this point the act was renamed "The Allisons". They each adopted a new name- Brian became John Allison and Colin became Bob Allison. This they thought would strengthen their professional image as "brothers". This new pairing worked well and by 1960, they had managed to obtain a residency at 'The Breadbasket' coffee bar in Cleveland Street. Other famous stars had precursed their careers here- notably Emile Ford, Wally Whyton, and Jimmy Justice. They entered a national talent competition co-sponsored by the pop newspaper DISC and a tape recorder manufacturer. They reached the finals at the ATV studio in Wembley despite a roster of 600 entries, and went on to win- then being invited to sing on Bert Weedon's TV programme "Lucky Dip" that same day. They also won a record test and taped several of the songs that John had previously written earlier during 1957 and 1958. These were submitted to Fontana Records in the hope of obtaining a full recording contract. Fontana were impressed and selected "Are You Sure" for submission to the UK heats to decide Britain's entry to the Eurovision song contest. Despite having turned professional less than a month earlier, the Allisons won the British heats and narrowly missed the top spot in the actual contest in Cannes. The Allisons' third UK release was issued with a picture sleeve- a very rare event in 1961. Sadly, the Allisons' follow ups to "Are You Sure" largely went unnoticed by record buyers. Doubtless, the Allisons were poorly prepared for the highly commercial world they had entered and management disputes, poor promotion and naivety took their toll. They achieved only two further minor chart placings in the UK. As the sixties progressed the pair eventually decided to split up and leave foreground pop music. At first, John turned to full time songwriting but the yearn to perform became too great and he soon found himself keeping the Allisons name alive whenever he could. He and Bob would reunite occasionally for short tours, but during the 1970s and 1980s John teamed up with other "brothers"- notably Mike "Allison" and Tony "Allison". 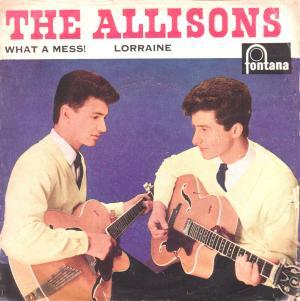 Ultimately, the Allisons, in common with many of the musicians whose popularity peaked in the 1960s have found themselves in great demand again. Although now 50 years have elapsed since he first felt compelled to sing, John Allison is still at it- and "Are You Sure" is still going strong. John and Bob now reunite regularly and they still harmonise their voices beautifully.